Can it be true that capitalists prefer crisis over growth? On the face of it, the idea sounds silly. According to Economics 101, everyone loves growth, especially capitalists. Profit and growth go hand in hand. When capitalists profit, real investment rises and the economy thrives, and when the economy booms the profits of capitalists soar. Growth is the very lifeline of capitalists. The answer depends on what motivates capitalists. Conventional economic theories tell us that capitalists are hedonic creatures. Like all other economic “agents” – from busy managers and hectic workers to active criminals and idle welfare recipients – their ultimate goal is maximum utility. In order for them to achieve this goal, they need to maximize their profit and interest; and this income – like any other income – depends on economic growth. Conclusion: utility-seeking capitalists have every reason to love booms and hate crises. But, then, are capitalists really motivated by utility? Is it realistic to believe that large American corporations are guided by the hedonic pleasure of their owners – or do we need a different starting point altogether? So try this: in our day and age, the key goal of leading capitalists and corporations is not absolute utility but relative power. Their real purpose is not to maximize hedonic pleasure, but to “beat the average.” Their ultimate aim is not to consume more goods and services (although that happens too), but to increase their power over others. And the key measure of this power is their distributive share of income and assets. Note that capitalists have no choice in this matter. “Beating the average” is not a subjective preference but a rigid rule, dictated and enforced by the conflictual nature of the system. Capitalism pits capitalists against other groups in society – as well as against each other. And in this multifaceted struggle for greater power, the yardstick is always relative. Capitalists – and the corporations they operate through – are compelled and conditioned to accumulate differentially; to augment not their personal utility but their relative earnings. Whether they are private owners like Warren Buffet or institutional investors like Bill Gross, they all seek not to perform but to out-perform – and outperformance means re-distribution. Capitalists who beat the average redistribute income and assets in their favor; this redistribution raises their share of the total; and a larger share of the total means greater power stacked against others. In the final analysis, capitalists accumulate not hedonic pleasure but differential power. Now, if you look at capitalists through the lens of relative power, the notion that they should love growth and yearn for recovery is no longer self-evident. In fact, the very opposite seems to be the case. For any group to increase its relative power in society, that group must be able to strategically sabotage others in that society. This rule derives from the very logic of power relations. It means that capitalists, seeking to augment their income-share-read-power, have to threaten or undermine the rest of society. And one of the key weapons they use in this power struggle –sometimes conscientiously, though usually by default – is unemployment. Unemployment affects distribution mainly through the impact it has on relative prices and wages. If higher unemployment causes the ratio of price to unit wage cost to decline, capitalists will fall behind in the redistributional struggle, and this retreat is sure to make them eager for recovery. But if the opposite turns out to be the case – that is, if higher unemployment helps raise the price/wage cost ratio – capitalists would have good reason to love crisis and indulge in stagnation. In principle, both scenarios are possible. But as Figure 1 shows, in America the second prevails: unemployment redistributes income systematically in favor of capitalists. 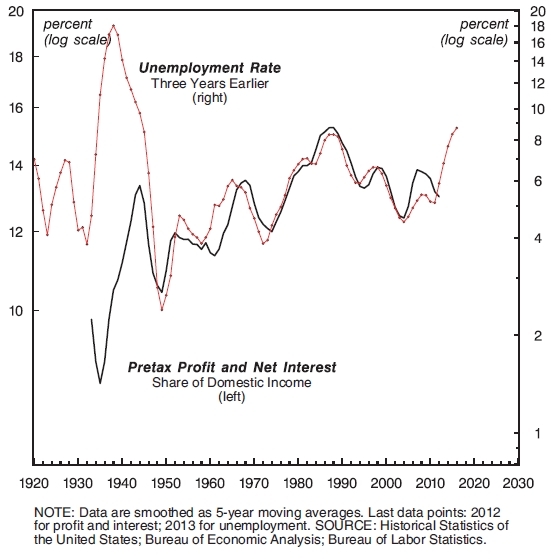 The chart contrasts the share of pretax profit and net interest in domestic income on the one hand with the rate of unemployment on the other (both series are smoothed as 5-year moving averages). Note that the unemployment rate is lagged three years, meaning that every observation shows the situation prevailing three years earlier. This chart does not sit well with received wisdom. Mainstream economics tells us that the two series should be inversely correlated; that the capitalist income share should rise in the boom when unemployment falls and decline in the bust when unemployment rises. But that is not the case in the United States. In this country, the correlation is positive, not negative. The share of capitalists moves countercyclically: it rises in downturns and falls in booms – exactly the opposite of what economic convention would have us believe. The math is straightforward: for every 1 percent rise in unemployment, capitalists can expect their income share three years later to jump by 0.8 percent. Needless to say, this equation is very bad news for most Americans – precisely because it is such good news for the country’s capitalists. Remarkably, the positive correlation shown in Figure 1 holds not only over the short-term business cycle, but also in the long term. During the booming 1940s, when unemployment was very low, capitalists appropriated a relatively small share of domestic income. But as the boom fizzled, growth decelerated and stagnation started to creep in, the share of capital began to trend upward. The peak power of capital, measured by its overall income share, was recorded in the early 1990s, when unemployment was at post-war highs. The neoliberal globalization that followed brought lower unemployment and a smaller capital share, but not for long. In the late 2000s, the trend reversed again, with unemployment soaring and the distributive share of capital rising in tandem. Looking forward, capitalists have reason to remain crisis-happy: with the rate of unemployment again approaching post-war highs, their income share has more room to rise in the years ahead. The power of capitalists can also be examined from the viewpoint of the infamous Top 1 percent. Most commentators stress the “social” and “political” problems created by the disproportional wealth of this group, but this emphasis puts the world on its head. Redistribution is not an unfortunate side-effect of growth and stagnation, but the main force driving them. 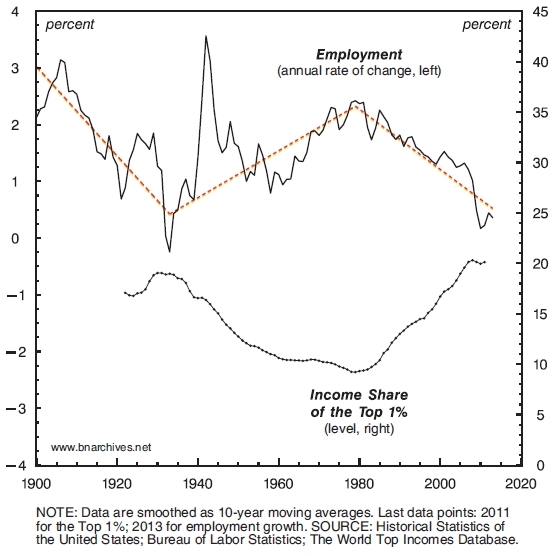 Figure 2 shows the century-long relationship between the income share of the Top 1 percent and the annual growth rate of U.S. employment (with both series smoothed as 10-year moving averages). And as the chart makes clear, the distributional gains of this group have been boosted not by growth, but by stagnation. The overall relationship is clearly negative. When stagnation sets in and employment growth decelerates, the income share of the Top 1 percent actually rises – and vice versa during a long-term boom. Historically, this negative relationship can be divided into three distinct periods, indicated by the dashed, freely drawn line going through the employment growth series. The first period, from the turn of the twentieth century till the 1930s, is the so-called Gilded Age. Income inequality is rising and employment growth is plummeting. 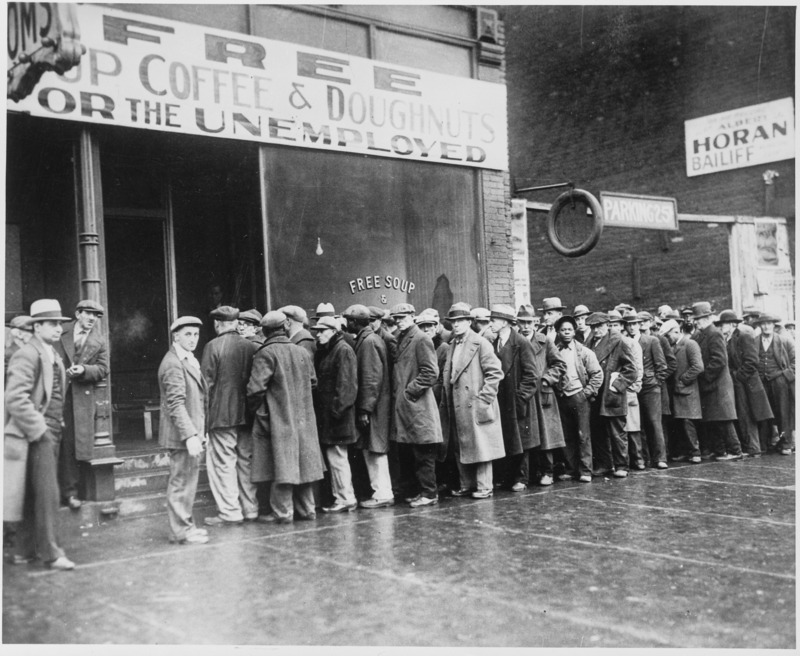 The second period, from the Great Depression till the early 1980s, is marked by the Keynesian welfare-warfare state. Higher taxation and public spending make distribution more equal, while employment growth accelerates. Note the massive acceleration of employment growth during the Second World War and its subsequent deceleration brought by post-war demobilization. Obviously these dramatic movements were unrelated to income inequality, but they did not alter the series’ overall upward trend. The third period, from the early 1980s to the present, is marked by neoliberalism. In this period, monetarism assumes the commanding heights, inequality soars and employment growth plummets. The current rate of employment growth hovers around zero while the Top 1 percent appropriates 20 per cent of all income – similar to the numbers recorded during Great Depression. So what do these facts mean for America? First, they make the fault-lines obvious. The old slogan “what’s good for GM is good for America” now rings hollow. Capitalists seek not utility through consumption but more power through redistribution. And they achieve their goal not by raising investment and fueling growth, but by allowing unemployment to rise and jobs to become scarce. Clearly, we are not “all in the same boat.” There is a distributional struggle for power, and this struggle is not a mere “sociological” issue. It is the center of our political economy, and we need a new theoretical framework to understand it. Second, macroeconomic policy, whether old or new, cannot offset the aggregate consequences of this distributional struggle. Not by a long shot. Till the late 1970s, the budget deficit was small, yet America boomed. And why? Because progressive taxation, transfer payments and social programs made the distribution of income less unequal. By the early 1980s, this relationship inverted. Although the budget deficit ballooned and interest rates fell, economic growth decelerated. New methods of upward redistribution have caused the share of the Top 1 percent to zoom, making stagnation the new norm. Third, and finally, Washington can no longer hide behind the bush. On the one hand, the concentration of America’s income and assets, having been boosted by large post-crisis bailouts and massive quantitative easing, is now at record levels. On the other hand, long-term unemployment remains at post-war highs while job growth is at a standstill. Eventually, this situation will be reversed. The only question is whether it will be reversed through a new policy trajectory or through the calamity of systemic crisis. On May 27th, Jonathan Nitzan will be speaking at the LSE Department of International Relations public lecture “Can Capitalists Afford Recovery?” More details. This article was originally published in Frontline on 16 April, and is based on the paper: Shimshon Bichler and Jonathan Nitzan, ‘Can Capitalists Afford Recovery? Economic Policy When Capital is Power’, Working Papers on Capital as Power, No. 2013/01, October 2013, pp. 1‑36. (http://bnarchives.yorku.ca/377/). It was also posted on the LSE USAPP blog. Jonathan Nitzan teaches political economy at York University in Canada. Shimshon Bichler teaches political economy at colleges and universities in Israel. All of his and Jonathan Nitzan’s publications are available for free on The Bichler & Nitzan Archives.